Victories that raise the minimum wage and provide paid sick and safe time for workers continue coast to coast. We saw workers fight and win high impact campaigns in the last few weeks in Minneapolis, Washington, D.C., and San Diego. The first of these victories came on May 27, when the Minneapolis City Council approved a new earned sick & safe time ordinance that will ensure that over 123,000 working people in the city can take paid time off to care for themselves or their loved ones. This is poised to be the first of a series of municipal earned sick time ordinances enacted in Minnesota in the coming months. The ordinance guarantees Minneapolis workers: the right to accumulate 48 hours of sick and safe time per year and to bank up to 80 hours that can be carried over to a new year; paid time off to access medical care, to manage and recover from incidents of domestic violence or sexual assault, and to provide dependent care due to emergency school and daycare closings; and a strong system of enforcement for employers. The effort to win earned sick and safe time in Minneapolis included numerous organizations who have made powerful and unique contributions to the campaign, including: CPD partners Neighborhoods Organizing for Change and TakeAction Minnesota, as well as Centro de Trabajadores Unidos en Lucha (CTUL), ISAIAH, Main Street Alliance of Minnesota, Minneapolis Regional Labor Federation, Minnesota Nurses Association, SEIU, and Working Minnesota. The good news just keeps on coming: This week we have two more victories to celebrate. 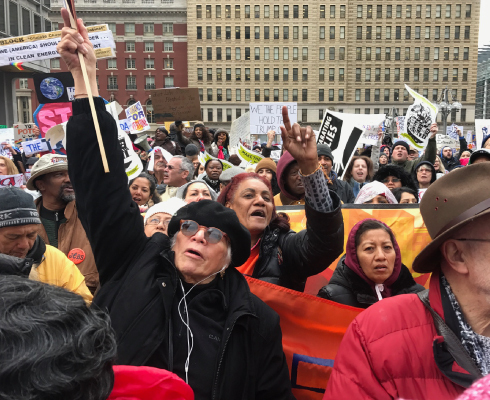 On Tuesday, in our nation’s capital, a long-fought battle for a minimum wage raise—which included a lawsuit by opponents to strike down a ballot initiative—succeeded with the city council’s vote to institute a $15 minimum wage. This raise will improve the lives of 114,000 working people of Washington, D.C., and will go a long way to help closing the racial and gender wealth income gap. In the Mayor’s announcement, she and the councilmembers acknowledged that the pressure from the ballot initiative went a long way to securing the vote. Working Families, Restaurant Opportunities Center DC, SEIU 1199, 32BJ, Unite-Here Local 25, UFCW Local 400, The Fairness Project, Dr. Bronner, and CPD partner SPACES were leaders in this fight. And in election primaries Tuesday night, June 7, San Diegans passed Proposition I by 63 percent, delivering an immediate raise to 170,000 workers, putting 260 million into the pockets of workers, and giving 279,000 workers five additional earned sick days. Raise Up San Diego, a diverse coalition led by CPD partner Center on Policy Initiatives, led this two-year effort. We've seen great progress toward achieving living wages in cities and states across the country. There is an undeniable thirst and momentum for change, and CPD and its partners, led by working men and women, are making real headway on passing laws that will make a lasting impact for our families.